The TTC will implement many service changes with the first of new fall 2018 schedules, with more (as yet not announced) to follow. The September schedules also include a return to winter service levels. I have not included these in the summary except where other changes happen at the same time. Updated August 1, 2018: The Express Bus Network service comparisons have been updated to include April 2018 (winter) service levels as well as the current summer services where these differ. In many cases, although the new service design is an improvement over summer service levels, there is little or no change from the winter service. This was already noted in the text describing each route, but it was not reflected in the detailed spreadsheet comparing before and after service levels. Updated August 1, 2018 at 10:40 pm: The original version of this post and the linked spreadsheet showed 503 Kingston Road reverting to bus operation in September. This is not correct. It will remain a streetcar route, but will terminate at its “traditional” York & Wellington location. In a previous article, I gave an overview of the new Express Bus Network that will be rolled out in coming months. The details of service changes for the first batch of routes are included in the spreadsheet linked above. In a few cases, the change is simply a question of rebranding routes with the new 900-series numbers, but in many service improvements are included. 37/937 Islington will have additional peak service between Steeles and Islington Station. 54 Lawrence East will have additional midday weekday service on the local branches. The 954 schedule is based on the old winter schedule for the 54E Express service. 60/960 Steeles West changes are mostly the return to the winter service levels with minor adjustments for reliability. 84/984 Sheppard West changes mainly reallocate buses between various branches, and extend the express service from Sheppard West Station to Weston Road. 85/190/985 Sheppard East and STC Rocket changes create a new peak period express service to Meadowvale, and switch articulated bus operation to the express services leaving standard sized buses on the local services on weekdays. Weekend schedules are unchanged except for the rebranding of the 190 as 985A. 102/902 Markham Road services are reorganized by reducing service on the local 102A to Centennial College, but adding more replacement service as the 902 express. 134C/913 Progress service to Centennial College is changed to operate express in the peak direction (outbound in the AM, inbound in the PM peak) from STC to the college, and service will run more frequently. 185/925 Don Mills is only a rebranding. There is no change to service levels. 191/927 Highway 27 will see improved peak period express service, but this is mainly the restoration of winter schedules. Otherwise, this is a rebranding. 195/935 Jane will see improved PM peak express service, but otherwise this is a rebranding. 198/905 UTSC/Eglinton East has some service improvements, partly through restoration of winter schedules, but is otherwise a rebranding. 199/939 Finch will see better peak service to Morningside Heights, but otherwise this is a rebranding. On the subway network, there will be one additional gap train (for a total of 3) on Line 1 YUS during the AM peak, and winter schedules will return on Line 2 BD. A new route number, 600, has been created for internal use for scheduled construction shuttle buses which will operate from Arrow Road, Birchmount, Mount Dennis and Queensway Garages, with a smaller contribution from Malvern Garage. The streetcar network will go through another shuffle of bus replacements in response to construction projects, the streetcar shortage and shifting demand for fall 2018. 501 Queen loses its 5 AM peak trippers from Long Branch. [Corrected] 502 Downtowner reverts to bus operation, while 503 operates peak only with streetcars and runs to York and Wellington, not to Spadina (Charlotte Loop). 504 King and 514 Cherry revert to schedules from April and May 2018 respectively. 505 Dundas remains a bus operation due to track construction at Lansdowne, and water main work east of Bathurst. 506 Carlton returns to streetcar operation with a handful of AM peak period bus trippers. 511 Bathurst switches to bus operation. Construction at Bathurst Station will require the streetcar loop to be shared between the 511 and 7 Bathurst buses. 512 St. Clair becomes 100% low floor with some adjustments in the service levels. Operations on 509 Harbourfront and 510 Spadina will be modified to improve service and eliminate bottlenecks at subway station loops. On the 509, all recovery time will be scheduled at Exhibition Loop so that streetcars do not wait on their scheduled departure time at Union. The recovery point for 510 will be shifted to Spadina and Bremner where layovers, if needed, will not block other streetcars at Spadina or Union Station Loops. A side-effect is that through riders may experience a delay at this location. This practice has been in place unofficially for some time during quieter periods on the route, but it does not deal with issues of washroom breaks and crew changeovers at the terminal stations. Work at Main Station will be complete by September, and all routes will revert to their standard arrangement there. Construction at Bathurst Station will shift all bus operations to the streetcar loop. Construction at Dundas and Lansdowne will divert the 47 Lansdowne bus via College, Dufferin and Queen both ways. Construction continues at Lawrence West Station requiring extension of routes that normally terminate there to Lawrence Station. Service on 29 Dufferin will be converted to articulated buses on Sundays. Further changes will occur in October with the Express Bus implementation on this route. Better service on the 36B Finch West bus between Yonge Street and Finch West Station. Better PM peak service to Steeles on 43A Kennedy. Better peak and midday service on 63 Ossington. Reallocation of buses between the two branches of 66 Prince Edward during peak periods to provide better service to Park Lawn Loop at the expense of service to Humber Loop. Better peak service on 79 Scarlett Road which, combined with the return of winter service levels, will provide considerably more frequent service. Better peak service on 88 South Leaside. Better peak and midday service on 100 Flemingdon Park. Route 123 Shorncliffe is renamed 123 Sherway, and a new branch via West Mall to Sherway is added during peak periods. Better AM peak service on 165 Weston Road North. The 21 Brimley route will shift from Birchmount to Malvern Garage, and the 102/902 Markham Road service will shift from Malvern to Birchmount. Updated July 26, 2018 at 1:15 pm: Stop locations added for September 2018 express routes. 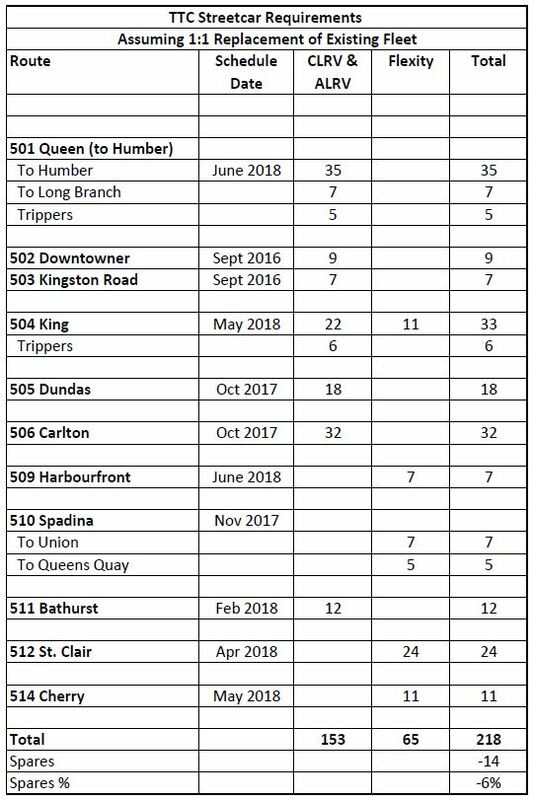 Starting in September, 2018, the TTC will begin to roll out its Express Bus network, a scheme that has been in the works for a few years and is described in the Express Bus Network Study of June 2017. The implementation will proceed over several months as schedules for the affected routes must be adjusted, and doing this as one “big bang” is more upheaval than TTC staff and management really need. At the same time as services are revised, they will also be rebranded into a consistent 900-series of route numbers regardless of whether they are “E” branches of existing routes or are “Rocket” services in the 18x and 19x range. Only the 14x Premium Express services will retain their numbers. Routes typically take the same number as the base route so that, for example, 954 is the express service replacing the 54E on Lawrence East. Where services run in a rapid transit corridor (current or future), they use the corresponding rapid transit number. For example, the existing 131E Nugget Express paralleling the SRT will become route 903. There are, of course, some exceptions just to keep those who try to memorize the entire list on their toes. The new routes and numbers are listed in the tables below. Changes for September are firm, and they will take effect with the new schedules on September 2, 2018. Other changes are proposed, but not yet scheduled. I will include service level details in a separate article on the overall September 2 schedule changes. Stop locations for the September changes follow the tables below. Northbound 937 buses operate EXPRESS from Islington Station to Rexdale, stopping only at Islington Station, Eglinton Avenue West, The Westway, Dixon Road, Monogram Place, Rexdale Boulevard. 937 buses operate LOCAL from Rexdale Boulevard and Islington Avenue to Islington/Steeles off-street loop. Southbound 937 express buses operate LOCAL from the Islington/Steeles off-street loop to Rexdale Boulevard. 937 express buses then operate EXPRESS from Rexdale Boulevard to Islington Station, stopping only at Rexdale Boulevard, Westhampton Drive, Dixon Road, The Westway, Eglinton Avenue West, and Islington Station. This route replaces the existing 54E with the same route and stopping pattern. This route replaces the existing 60E with the same route and stopping pattern. During peak periods, the express service will be extended from the existing 84E terminus at Sheppard West Station to Weston Road. Off peak express service will end at Sheppard West Station as at present. Westbound stops: Sheppard Station, Brentwood Avenue, Bathurst Street (nearside), Bathurst Street (farside), Wilmington Avenue, Wilson Heights Boulevard, Sheppard West Station, Bakersfield Street, Keele Street, Sentinel Road, Arleta Avenue, Jane Street, Weston Road. Eastbound stops: Bradstock Road at Weston Road, Sheppard Avenue West at Abraham Welsh Road, Jane Street (nearside), Jane Street (farside), Northover Street, Sentinel Road, Keele Street, Vitti Street, Sheppard West Station, Faywood Boulevard, Bathurst Street (nearside), Bathurst Street (farside), Easton Road, Sheppard Station. 985A will operate to Scarborough Centre Station as the 190 does today. 985B will operate to Meadowvale Road during peak periods. Local service on route 85 Sheppard East will be provided by standard buses, and artics will be used for the 985 services. One stop will be added on the common section of the route at Brian Drive / Consumers Road. Eastbound stops (985B only): Brimley Road, McCowan Avenue, Havenview Road, Markham Road, Progress Avenue, Lapsley Road, Neilson Road, Breckon Gate, Morningside Avenue, Grand Marshal Drive, Conlins Road, Dean Park Road, Idagrove Gate, Meadowvale Loop. Westbound stops (985B only): Meadowvale Loop, Meadowvale Road (farside stop), Idagrove Gate, Rouge River Drive, Conlins Road, Water Tower Gate, Morningside Avenue (farside stop), Brenyon Way, Neilson Road, Washburn Way, Malvern Street, Markham Road (farside stop), Shorting Road, McCowan Road, Brimley Road. A new peak and midday express service will operate from Warden Station to Sheppard via Centennial College. Southbound stops: Markham Road at Sheppard Avenue East, Progress Avenue at Milner Avenue, Centennial College Progress Campus, Markham Road at Progress Avenue, Markham Road at Ellesmere Road, Markham Road at Brimorton Drive, Markham Road at Painted Post Drive, Markham Road at Lawrence Avenue East, Markham Road at Blake Manor Boulevard, Markham Road at Eglinton Avenue East, Kingston Road at Parkcrest Drive, Kingston Road at McCowan Road, St. Clair Avenue East at Kingston Road, St. Clair Avenue East at Brimley Road, St. Clair Avenue East at Midland Avenue, St. Clair Avenue East at Danforth Road, St. Clair Avenue East at Birchmount Road, Warden Station. Northbound stops: Warden Station, St. Clair Avenue East at Birchmount Road, St. Clair Avenue East at Danforth Road, St. Clair Avenue East at Midland Avenue, St. Clair Avenue East at Brimley Road, St. Clair Avenue East at Kingston Road, Kingston Road at Cathedral Bluffs Drive, Kingston Road at Parkcrest Drive, Markham Road at Kingston Road, Markham Road at Eglinton Avenue East, Markham Road at Blake Manor Boulevard, Markham Road at Lawrence Avenue East, Markham Road at Painted Post Drive, Markham Road at Brimorton Drive, Markham Road at Ellesmere Road, Markham Road at Progress Avenue, Centennial College Progress Campus, Markham Road at Sheppard Avenue East. This peak period service will replace the peak direction trips now operated by 134C Progress between Scarborough Town Centre and Centennial College. Counter-peak trips will continue to operate as 134C. This service replaces the existing 185 Don Mills Rocket and will have the same stopping pattern. This service replaces the existing 191 Highway 27 Rocket and will have the same stopping pattern. This service replaces the existing 195 Jane Rocket and will have the same stopping pattern. This service replaces the existing 198 UTSC Rocket and will have the same stopping pattern. This service replaces the existing 199 Finch Rocket. Two stops will be added on Finch Avenue West at Torresdale Avenue and at Goldfinch Court. Forty-five years ago, on June 24, 1973, Peter Witt car 2766 began operating on the streets of Toronto as the Tour Tram. For that first day, the car was decked out with bunting, Canadian and Ontario flags, a Union Jack and photos of HM Queen Elizabeth whose official birthday was celebrated about a week earlier in mid June. In a previous article, five years ago, I showed the restoration work at Hillcrest Shops. Now, here are photos from on-street operation in the early days. The photos are arranged geographically around the route rather than by date. At the end of the gallery are a few shots of a Tour Tram diversion on Adelaide Street on its third day of operation. Throughout these photos there are many buildings that no longer exist and views that are now impossible to take because open spaces have been filled in with redevelopment.